Good for 24 months from date issued. Certificate will be mailed to you. Available for day or evening charter. Good for 24 months from date issued. Certificate will be mailed to you. 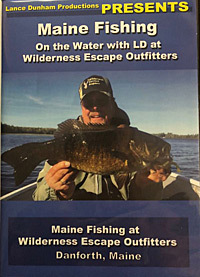 Come join Lance as he goes up to Wilderness Escape Outfitters with Randy and Sharon Flannery to fish some of North Maine's most pristine waters. Hear from Randy himself as to how Wilderness Escape Outfitters came to be and what they have to offer. 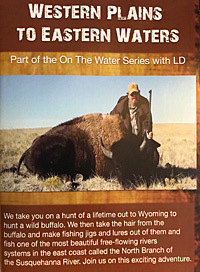 Follow Lance as he goes on a hunt of a lifetime out to Wyoming to hunt a wild buffalo. We then take the hair from the buffalo to make fishing jigs and lures out of them and fish in one of the best smallmouth fisheries in the world, the Susquehanna River. Join us in this exciting adventure. 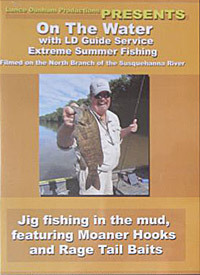 Join Guide Lance Dunham from LD Guide Service on another fishing adventure on the North Branch of the Susquehanna River. Lance will show you how using the right crankbait can pull bass from high muddy water common after a summer rain. 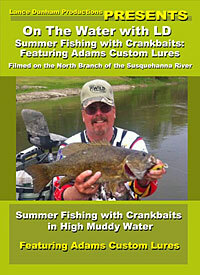 Featuring a detail interview with the inventors of Adam's Custom Lures. Adam will discuss how he designs his crankbait to have a more lifelike action and super loud rattles to draw big bass into striking even in muddy water. In this 1hr DVD, Lance takes you from the hunt where he harvests a pheasant with his pistol, to the proper way to field-dress the bird to get the choice feathers and meat cuts. He will show you one of his favorite pheasant recipes and then take you on board his boat where the fishing jig will be made from the feathers harvested, to catching numerous fish in the cold March winds in cold water where failure is not an option for this veteran fishing guide. Come fish with Lance Dunham of L.D. Guide Service on a muddy Susquehanna River in the heat of August. 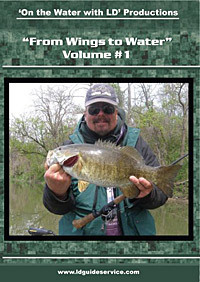 This fishing guide of over 30 years will show you how he puts fish in the boat when most fishermen stay home. From the rods he uses to the jig fishing techniques in high fast water. With his guests, the Wilsons of Moaner Hooks, they will show you many fishing scenes and a great time.